Slides2Go | Presentations have never been so easy! Giving presentations has never been so easy! Slides2Go is the presentation tool that enables you to give perfect PowerPoint and PDF presentations–whether it’s on your tablet, smartphone or computer. With Slides2Go, presentations are centrally managed and logically arranged and you can direct different content to different users. Better consulting. Better presentations. More sales! Slides2Go is compatible with PC, Mac, tablets and smartphones, and works reliably on Android, iOS, Mac OS X and Windows operating systems. PowerPoints are displayed with go-to commands, videos and audio optimized, allowing you to give an exciting presentation. The centralized management of all documents ensures your presentations and files are as up-to-date as possible. Slides2Go makes your data available anytime and anywhere on your logged in devices ― whether you’re online or not pop over to this website. The analysis of the use of presentations and their components is the basis for optimizing your documents. In addition to the general user behavior, Slides2Go measures the time spent in the presentation determining the concrete content meaning, so that the potentials for improvement can be geared towards the selected goal. Slides2Go raises the quality of your consulting meetings with optimized and reliable display of your presentation materials. All documents are always up-to-date, and the clear structure makes them easier to manage. No annoying searching, no wasted time, no stressed-out employees. Licensing agreements with moderate durations help you to avoid long contract commitments and the high initial costs often associated with purchasing software or additional hardware. Slides2Go can be used with nearly any device, and the advantages are available immediately. There is no limit to the number of users. Whether for one or 10,000, Slides2Go is scalable and can be customized for use in all industries and for all purposes. With a back-end that is easy to understand, even large numbers of users can be conveniently managed and easily organized. Slides2Go allows you to forward your data with a convenient share page. The shared data are available there for your customers as an HTML link or a PDF for download. Whether 30 MB or 300 MB, your presentations reach their destination directly without overwhelming your customer’s inbox. Server locations in Germany and SSL certificates ensure optimum security for your data our website. Upon request, we can integrate additional precautions to guarantee the greatest possible security even for sensitive data. Then test Slides2Go at no charge! According to your requirements all PowerPoints, PDFs and Office files can be organized in a clear and dynamic folder structure. With this, all names, icons and thumbnails can be changed and adjusted to your liking mgoqrkm. Simply sign up for free and upload your first files from the Slides2Go back-end. Simply download the Slides2Go app from our site or from the Google Play Store for your Android device, or from the App Store on your iPhone or iPad and log in with your access data. After the initial synchronization of your content, you can already get started and give presentations. Sales and field employees often have the problem that they do not have available the latest PowerPoint presentations or just the laptop battery is empty. But with help from Slides2Go you can upload the current Powerpoint presentation in the office and the sale staff can give their presentation online or offline using their tablet. The PowerPoint slides are thereby converted and adapted for any device – whether on a Samsung tablet, iPad, on Web or on iPhone & Galaxy. The result is always optimal. Slides2Go is one of the few applications with which it is possible to display PowerPoint files on the iPad or Tablet. 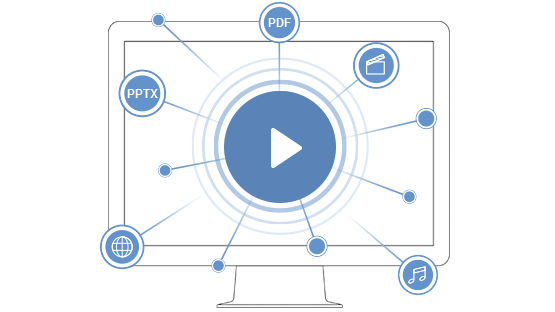 Slides2Go supports all the important Office file formats like PowerPoint, PDF or mp4 relevant for a successful presentation. Multimedia content embedded in PowerPoint is played back and displayed perfectly. This way Slides2Go combines the advantages of a central cloud-based management service with the advantages of an innovative and groundbreaking presentation tool.